The house that I live in was constructed in1989. It was decorated by the builder’s wife. The predominant color of the interior is pink. Light pink walls and matching trim, pink tile, pink carpet, and pink is a dominant color on the wallpaper too. The house was originally purchased by my wife’s grandparents. My wife came into possession of the house and was living there when we were married. Since she had no intention of moving into my one bedroom apartment, we opted to live in her house; thus I didn’t have a choice in the color scheme. Anyway, the wife decided that we needed to paint the hallway and living room. She requested that I take a week off in June to help her with the task. Folks, any opportunity to purge pinkness from our home is too good to pass-up. So I jumped at the chance. My budget was $500 for paint and supplies. 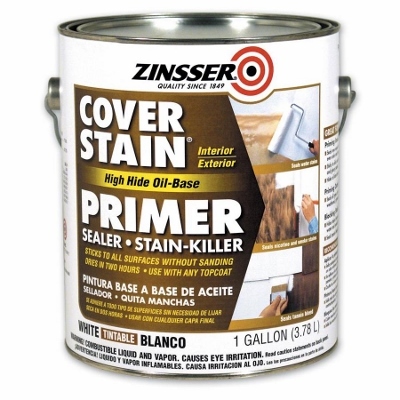 We knew that we needed a special primer because the trim work in the house was a glossy oil-based paint. We both spent much time searching on the Internet for just the right primer. Sadly, like any other buying decision, what we found was lots of opinions and anecdotal stories but very few facts. We decided to go with an oil-based primer that claimed it could go over any surface-latex or oil—without sanding. Once applied, the product also said we could cover it with either oil or latex paint. Cover-Stain is recommended for application on interior and exterior surfaces that have been damaged by fire, smoke or water. 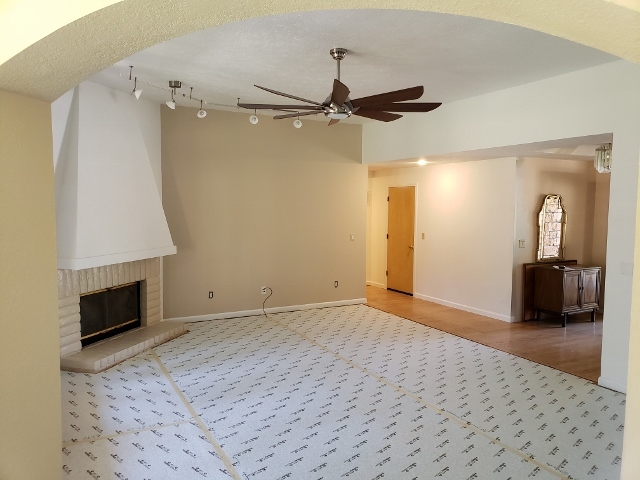 Interior surfaces include new or previously painted drywall, cured plaster and cementbased coatings, wood (including pine fir, cedar, redwood, and plywood), metal (including aluminum, iron, steel, and cooper), vinyl, PVC, masonry (including stucco, concrete block, poured concrete, and brick). Based on the description above, we went with Cover Stain. However, being that we live in California finding this product was our next obstacle. Per internet information, we found two gallons in Ceres California. That was all that was available from the big box stores in the northern part of the state. It was cheaper and available in large quantities at all Reno Home Depot stores and at a lower price than anyone offered in California. My wife wasn’t keen on me driving to Reno and wanted me to wait. We found that Kelly-Moore Paints had some buried in the back of their store. Eventually we bought a five gallon bucket from them. The Cover Stain that we got was more like syrup than paint. It also dried a light brownish green color not white as we were led to believe from their internet information. After applying, we had to use at least two coats of latex paint just to cover it and get a white color on our walls. We painted the wood trim after finishing the walls. Because we were painting our hallway, almost every door jamb in the house received paint as part of our project. 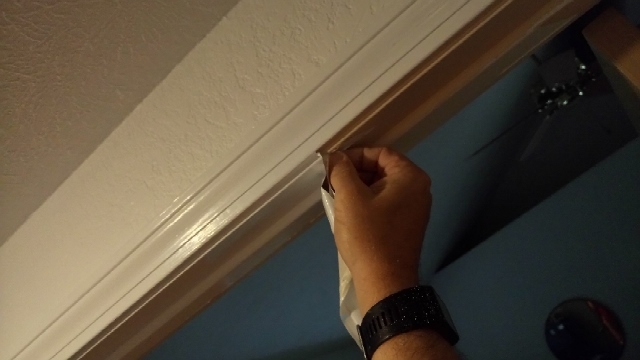 Once the hallway was done, we began putting hinges back on door jambs and removing the Frog Tape that we had used to control where paint was applied on door jambs. 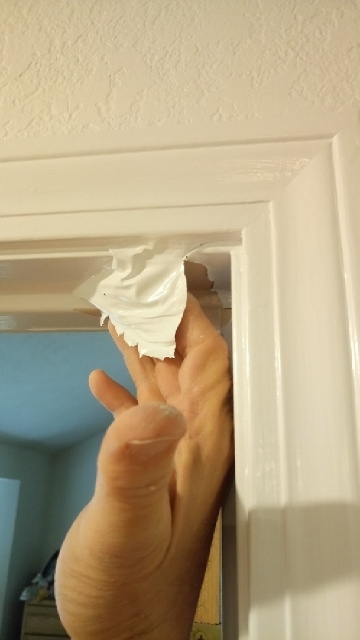 We weren’t painting both sides of the door jambs, just the part visible from the hall. The rooms connecting to the hall were being save for future projects or had been done previously. 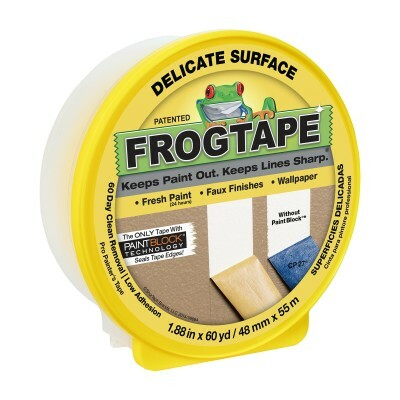 Frog Tape recommended by Consumer Reports online reviews. It was at this point that our best laid plans and internet research all confronted reality and the results were ugly. Here are photos of the results. 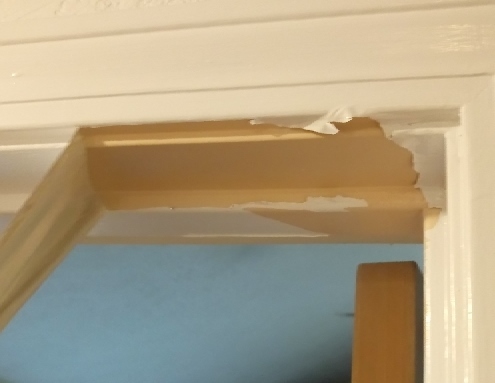 Typical results of peeling paint following application of Cover Stain and two coats of latex paint. All ten door jambs peeled just like this one. Remember all the claims of sticking to any glossy surface with no sanding, yeah right. Dream on baby. So guess what? We had to scrape and sand every door jamb; all ten of them. We took them all down to the wood, primed them, and then painted. This took two sanders because we killed the first one, lots of sweat equity, and five days of labor by two people. We spot checked some of the base trim and had to redo a few of them also. We spent twice the amount of time on this project as we had estimated and three times the money. We ended up spending $500 with Kelly-Moore Paint, and split the paint supplies between Home Depot and Lowes. As the color went on the living room walls, mama began wanting to make other changes so we had to buy a new ceiling fan and lights. Since the walls were now white and not a dark pink color, we needed to change the plugs, switches, and cover plate colors from almond to white. Finally the carpet installers arrived to replace our 29 year old floor coverings. The finished product looks nice. 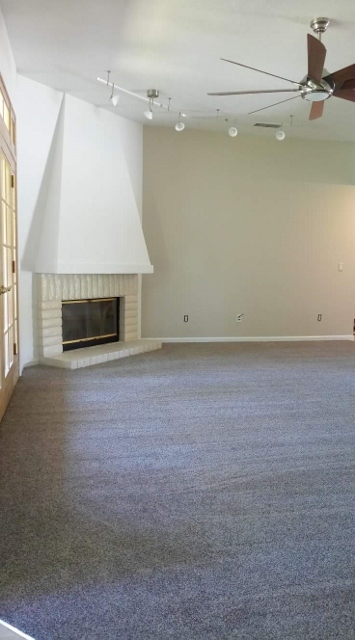 Sadly, the front room and entry way don’t match the new paint job so guess what mama wants us to do in July. Now that we have more experience working with the pink paint from hell, I hope we knock this out quickly.